This Kingdom Rush: Rift in Time review was made after playing through the first three scenarios. We were sent a prototype copy of this game by the publisher in exchange for an honest review. This is a Kickstarter preview, so rules and components could change before the game comes out. This will become a review once we’ve had a chance to play the full game. What is Kingdom Rush: Rift in Time? Kingdom Rush: Rift in Time is a cooperative tower defense game based on the very popular mobile game Kingdom Rush. 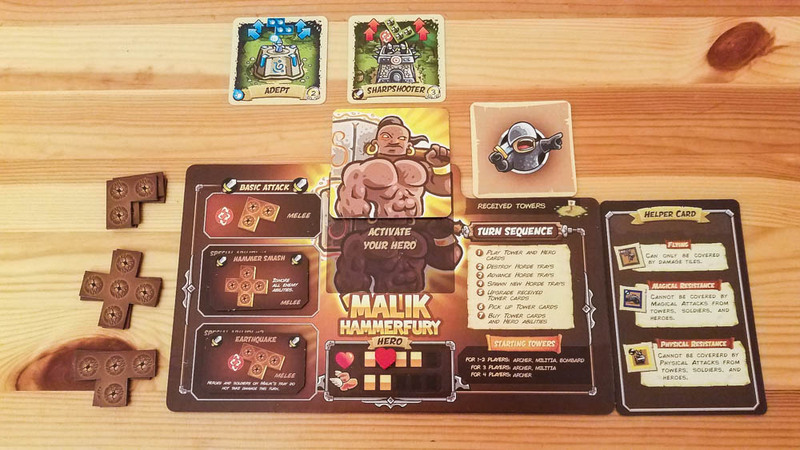 In this game you’ll be using your towers and heroes to defend your kingdom against all of the enemies and portals that the Time Mage throws at you. 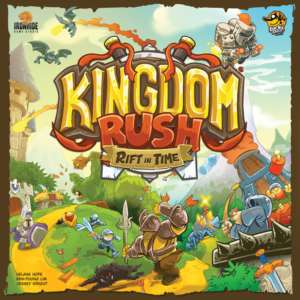 Kingdom Rush: Rift in Time was designed by Helana Hope, Sen-Foong Lim, and Jessey Wright, and it will be published by Lucky Duck Games. The scenarios you play in Kingdom Rush: Rift in Time all have unique board layouts and different groups of enemies that you’ll have to face. The scenario booklet will also tell you where to put each building site, which is where you’ll be able to place your towers throughout the scenario. During the main phase of each round, you’ll get to attack with towers, pass towers to teammates to upgrade them, and move your heroes around the board. You can do any of these actions during this phase and players can perform actions in any order. What you’re trying to do is use your damage tiles (the polyominoes) and your heroes to cover the enemies on the horde cards before they make it to the exit. The towers show which directions and how far they can shoot. 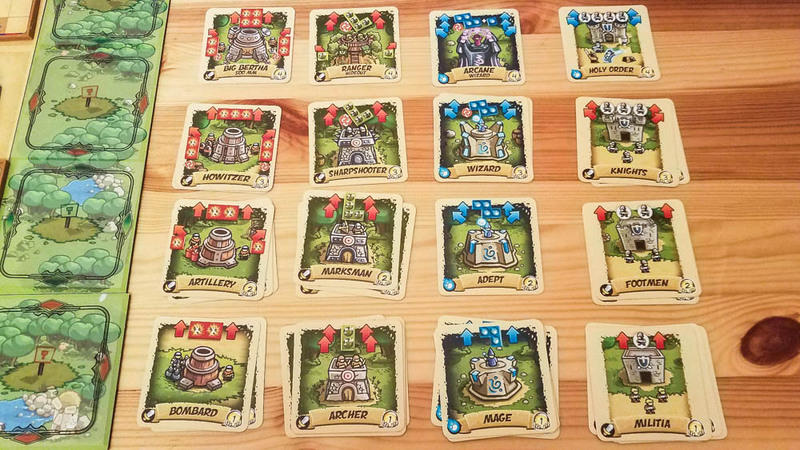 You start out with just a few Level 1 towers that have restrictive placement rules for their damage tiles, but you can upgrade the towers to give you more flexibility. 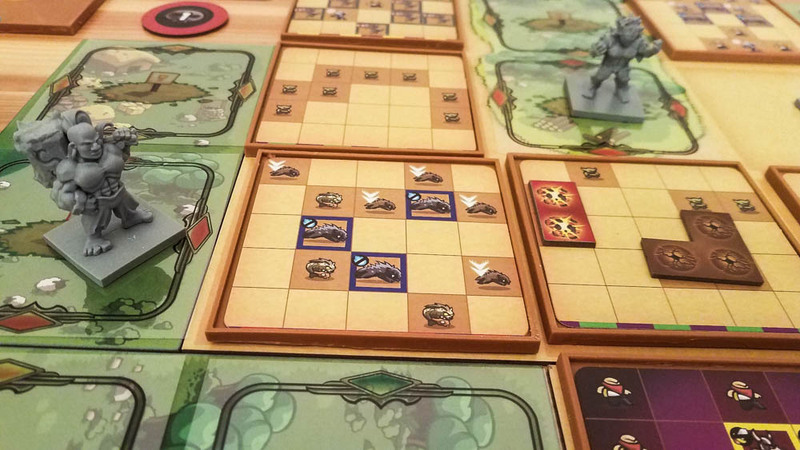 The heroes move around the board and use their unique abilities to attack the enemies. You can use your hero’s miniature and their damage tiles to cover spots on horde trays. Heroes take damage when they’re on horde trays at the end of rounds and when they attack portals, but they can recover all of their health if they don’t end up on a horde tray during a round. Some of the enemies on the horde tiles are resistant to certain types of damage while others “fly” and can only be hit with ranged attacks. There are also some enemies that heal, some that deal damage after they move, and others that make their hordes move faster. You’ll often be trying to come up with ways to cover the most threatening enemies on a tile if you’re not going to be able to cover all of the enemies that round. Every time a horde tile makes it to the exit, you’ll lose hearts based on the number of uncovered enemies; you begin each scenario with seven hearts. Your main focus is one destroying the purple portals. These cards have enemies on them just like the horde tiles, but they have special rules. Each portal will have a tower level written on it, which is the lowest level tower that you can use to attack it. Also, any towers that were used to attack a portal are removed from the board at the end of the round. If any portal makes it to the exit tile, you’ll immediately lose. After the main phase is over, any horde tiles that were destroyed are removed from the board and your team will get coins to use later on for new Level 1 towers (2 coins) and special abilities for your heroes (1 coin each). Then the surviving hordes will advance toward the exit and new horde tiles will spawn. Horde tiles don’t move when they have soldiers or heroes on them, but soldiers are removed from the tiles and heroes take one point of damage. After the hordes have done their thing, anyone that had one or more tower cards passed to them during the main phase will upgrade those towers to the next level; this is the only way you can upgrade the towers. You’ll then pick up any towers that were used during the round and optionally use any coins you have to buy new towers or special abilities. Then a new round begins. You’ll win if you’re able to destroy all of the portals. You’ll lose if you lose all of your hearts or if a portal is able to make it to the exit tile. This is a very unique game. It has the classic tower defense feel, but you’re actually defending your kingdom with the towers you build rather than simply defending a tower. I’ve never played a board game like this. Everyone in my group had analysis paralysis while playing this game, which had never happened to us before. I have a feeling most groups will go through this because you want to figure out the perfect way to use your heroes and towers while also deciding which towers to upgrade. 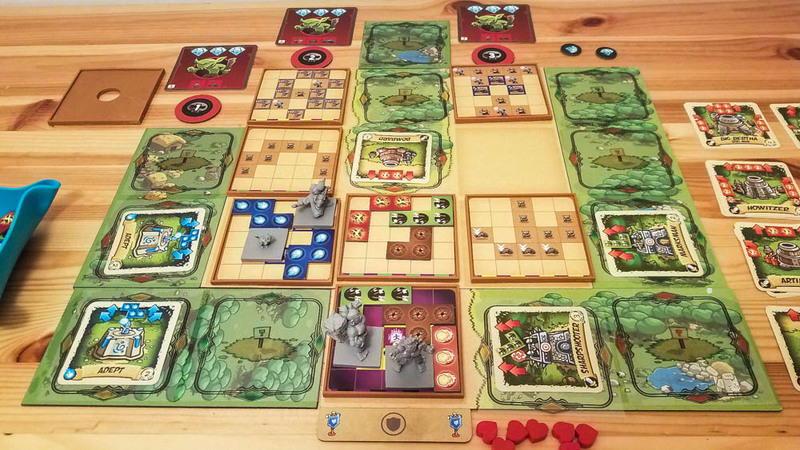 One person will put one of their towers on the board and cover up some enemies, then after thinking about it for a bit your group might figure out a potentially better way to deal with those enemies. It feels GREAT when you come up with the perfect placements for your damage tiles. It really is very similar to that feeling you get when you clear lines in Tetris. The special abilities definitely do help to make each hero feel different than the rest. I especially like Alleria’s Wildcat ability, which basically gives you a new hero to move around the board. This game does have the feel of the Kingdom Rush mobile game except for one thing: the pacing. Each round you’re basically playing a static puzzle game where you’re trying to figure out how to ensure nothing reaches the exit when the new horde tiles spawn. That’s not a bad thing, but it doesn’t have the speed and timing aspects of the mobile game. Those plastic horde trays were a great idea. It’s very easy to slide them along the paths. Giving up towers to your teammates to upgrade them is one of the coolest cooperative actions that I’ve seen. It also forces everyone to make some tough decisions (Should I use the tower this round or make it more powerful for future rounds?). It’s very satisfying when you get to use the more powerful towers. You have to put in a lot of work as a team to get those towers, so it feels great when you get to use them to take out a bunch of enemies. The game has a great look to it, even in prototype form. The artwork is nice and clean and the miniatures look fantastic. Quarterbacking could end up being an issue for some groups. There’s no hidden information so it could be tempting for one person to try to take over, especially if they are the best puzzle-solvers in their group. I can tell that the scenarios are going to get very tough. We beat the first three, but the third one was pretty challenging and supposedly they get progressively harder as you move forward through the campaign. I think Kingdom Rush: Rift in Time will end up having some replay value. I doubt many people will play the first few scenarios multiple times, but more horde cards are added as you progress, so those puzzles will be different every time you play them. I’m really looking forward to seeing how the bosses work and all of the other scenarios that the designers have created for the game. Thanks for taking the time to read our Kingdom Rush: Rift in Time preview! To stay updated on all things cooperative board games, follow us on Twitter, Facebook, or via RSS.